One quiet summer afternoon, several years ago, when my son was three years old, we went to the local neighbourhood library. There he played happily with a huge pirate ship set out on a low table filled with colourful blocks and wooden puzzles at the children’s section. Soon a little girl his age came along and as they played side by side, my young child turned and gave her a hug as a sign of his affection and friendship. The little girl froze and let out a piercing scream. Stunned, my son stumbled back, his little face quivering with confusion as he battled with his own tears. My heart is pierced even now reliving this incident. Grieved. That we can even begin to consider a 3-year old child as a stranger. Someone to be shunned. To be wary of. Just because we do not know his name. Just because he looks different. Just because he is not one of our own. I am thinking of another 3-year old today. His name is Aylan Kurdi. He was from Syria and was on a boat with his father, mother and his older brother Galip, 5, together with other illegal immigrants when they capsized in the Mediterranean Sea. His little body washed up on shore. Even in death, one could see that he was loved. His father must have tied his young son’s shoelaces up before they left for that all important journey. His mother must have picked out his best clothes for the day when they woke up that morning. What hopes and dreams this young family must have held in their hearts to have made this perilous journey. Is this little one a stranger too? Have we really come to this as a humankind? To fend off those who are merely asking for a pinch of our hospitality? Could we really have become so hardened in our hearts that we allow strangers as young as three to drown in our seas? My heart boils with a grief I cannot describe. That we have allowed strangers in our midst to perish. Just because we do not know their names. Just because they look different. Just because they are not our own. For strangers are to be shunned. To be wary of. Even if this stranger was just 3-years old. “I ask you not to think only of yourselves. Be kind to the strangers, whether come they from Turkey, Japan, Persia, Russia, China or any other country in the world…. After all, why should any foreign people be treated as strangers? Do not be content with showing friendship in words alone, let your heart burn with loving kindness for all who may cross your path. Oh, you of the Western nations, be kind to those who come from the Eastern world to sojourn among you. Forget your conventionality when you speak with them; they are not accustomed to it. To Eastern peoples this demeanour seems cold, unfriendly. Rather let your manner be sympathetic. Let it be seen that you are filled with universal love. When you meet a Persian or any other stranger, speak to him as to a friend; if he seems to be lonely try to help him, give him of your willing service; if he be sad console him, if poor succour him, if oppressed rescue him, if in misery comfort him. Please, let there be no more strangers in the world. For more ways on how you may help the refugee crisis and migrants seeking help in Europe, please visit this link sent by my dear friend Kitty over at The Daily Round. Thank you for sharing. Very very well said. Oh, Sharon, I so agree with you, and, as always, you’ve expressed so beautifully what’s been banging around in my heart and spirit regarding these poor seekers of peace and comfort. It’s especially devastating, I think, because we have enough: room, food, clothing, intelligence and creativity. We could solve this, working together. Thank you for doing what you can to remind us that our call and responsibility as humans is first and foremost, kindness and open arms. I woke up today in Mandalay, Myanmar… and read your post. Being away from my family is already hard enough. To lose them so tragically would be devastating. Your words gave me a new perspective, a face to these refugees and I found myself sobbing and praying for this precious family. Thank you for reminding us how blessed we are…and that it is a privilege to share what we have with those who are less fortunate. Thank you for being my inspiration. I’m so proud of you, Deshan and Sam. Lots of love – JK. A beautiful and powerful post. I’m not liking this world we live in lately. Thank you for putting another face on these refugees, and their perilous plight. We need to remember that they really don’t want to leave their world, but have no choice; they are being forced out by the world’s lack of political will to help them. We refuse to help them save their own country, then we turn the other cheek of cruelty by making their lives hell trying to get to a better life. Its not only the US, but the world in general, and its inhabitants, that have become cruel and heartless. So sad but such a beautiful post. Thank you for writing such a moving piece and sharing it with the largely-apathetic denizens of the internet. Perhaps more posts like these will begin to shift that culture of by-standing and apathy. This is a story of vital recognition. Thank you for once again reminding me as to our interconnectedness, our one-ness. There is no Them versus Us. Only We. We can do so much good together. If we use our hearts to see. The photo above is of my son who was 18 months old at that time in Sri Lanka. We were walking along the beach in Colombo when we came upon a hut amidst a stretch of litter and rubble. A little girl stood at the entrance of this tiny broken house and gave us a huge wide smile as if she had been expecting us. My son and this girl became instant friends as they romped around on the beach, giggling and poking among the litter. Nothing was said but the warm affection they showed each other shone like the sun. That is how our world should be. That is how I think all children must be like. That is how we must be like. Yes yes yes! I was just saying to my husband yesterday, should we take in a Syrian family? What a tragedy is unfolding. Thank you for writing about it. I have been following this lovely blog for several years. In this beautiful post, Sharon echoes many of my thoughts and the heartache that we share about the refugee. Be kind to each other, fellow humans. Thank you, Sharon. So heartfelt, beautiful and wise…thank you Sharon. It’s a lovely post be it has little to do with the way anyone looks or who they are and it has everything to do with MONEY. Now days, that’s all that seems to matter. If they were rich, they would be saved, no matter who they were. Something is very wrong. This is a beautiful post and I agree with you so much. This is so touching and beautiful Sharon. The message is one to be absorbed into all of our being … until we get it in our mind body and soul … and not just our head. Something that we need to be reminded of. We are becoming disconnected from humanity. A wonderful message, eloquently conveyed. Aylan’s legacy may well yet prove to be of great historical significance, and in this I hope. The response of European citizens to the refugees arriving on their doorstep has been deeply impressive for the most part. Let us hope the politician’s follow the lead of the people. As an aside, I wrote a somewhat similar post on the tragedy: http://wp.me/p4wkZJ-d5 Best regards, and in gratitude, Hariod. Thank you Sharon. This is a message we need to own deep in our being. The spirit of humankind calls for far more kindness than what we collectively exhibit at this time. It’s such a pity to call a three-year-old a stranger. I don’t teach my pupils that way. Nowadays most of the people are treating those around with coldness and that’s what I can’t stand for. I felt heartsick seeing the body of the boy lying on the shore on the paper. It’s really shocking me. I can’t imagine what this world would be in the years to come. To change the world, the Man should start loving and caring for each other. Sharon children usually except each other no matter how different they all are, it is a sad thing when the parents instil such negativity on one so young. I believe we should treat each other how we liked to be treated. 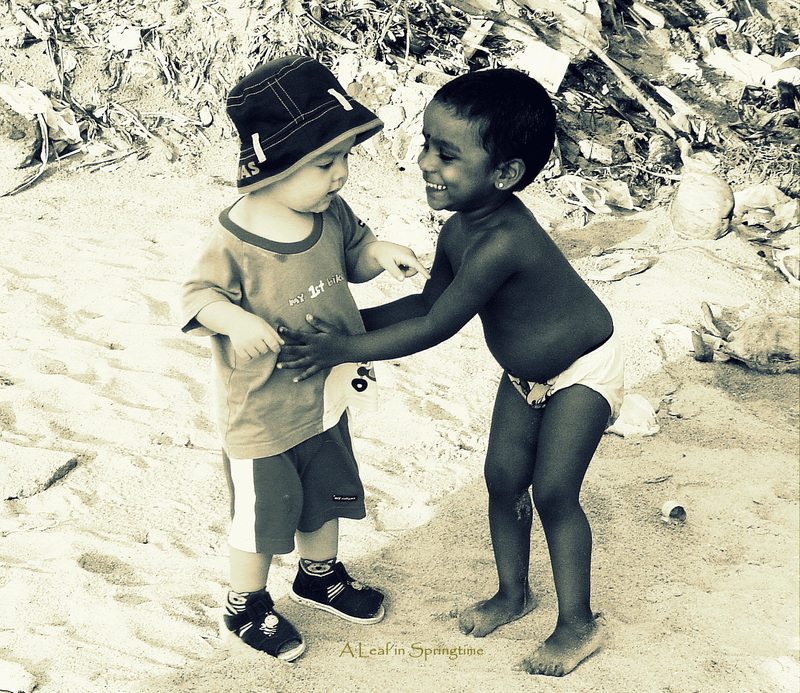 Hoping we can raise children who will embrace our diversity and accept that difference is the magic that can teach us many things in this world. This is beautiful, shared it on Twitter. Hi Sharon! I feel totally the same way as you! I would like to share this on Facebook! I feel so much about the situation of the migrants and especially for the innocent children that i MUST get up and do something (besides giving money, besides trying to Teach the Faith)… have to find a way to help hands on! / As I am in Greece where thousand come, I am searching for ways to help… Love and prayers! Beautiful article! Hi Sharon, I’ve been thinking of you, and stopped by for a visit. Your blog is truly gorgeous ! How I envy how it looks, and the beautiful images and posts that you’ve shared here. Thank you for this post. As heartbreaking as it is, it is also a good reminder to be open…in our hearts and in our borders…to those who seek our kindness and those who do not. Sharon, thank you for this lovely post. How very sad – how tragic – for that little girl innocently playing and hugged by your son – who has been taught at such an early age that all strangers are to be so deeply feared. She will no doubt grow up to add to the prejudice against others and the misunderstanding of the plight of anyone “not her.” And how tragic – that there are so many in the world unable to comprehend the heartbreak and needs of others. Reminds me of these words, “Let there be peace on Earth and let it begin with me.” More in this world need to sing. So beautifully written. That quote is so strong. Just what we need to hear and what we need to teach our children. It is heart wrenching to see so many make a perilous journey and be met with less than human understanding and kindness. Thank you for sharing your story and your thoughts. The world’s children are the children of all of us. Reblogged this on Radiating Blossom ~ Flowers & Words. Thanks for sharing such a lovely and inspirational article! This is beautiful! I love your voice. That underlying emotion, fear, shuts us off from others and the world and generates a lot of irrational and ugly emotions in its wake. So poignant. I’m touched by your compassionate heart. Thank you so much for taking the time to reach out to me. And for leaving such a thoughtful and kind message. I so wholeheartedly agree with your comment that we are all people, one people and to distinguish and to exclude is a grave injustice indeed. We are all learning to make this world a better place – even if others do not share the same belief. I try my best to teach this to my son. Thank you so much for your care! I would love to hear from you again. Keep well. Blessings dear one. What a poignant read. It is scary today how we treat others who appear different to us. I know I too am wary and shy of new people things and ideas. Here in Switzerland I am much aware of the troubles that migrants are enduring as they seek refuge here in Europe, not only in our country and cities but in our villages, even the one I live in. It is hard to accept change and to remember that once, I too was a migrant, and how I once felt and still feel in this partly still strange land. Thank you for your constant reminders of what is really important, love and humanity. Bloom where you are planted. Yes that is a lesson I am learning slowly. Not so much in Switzerland, as I have lived here 11 years and feel more at home here now than in Bermuda, but at home in this suburban village where I live. I have struggled to accept it for the last few years and struggle to accept that not everything can be your perfect ideal. Yes, blessings to you too, for I get a lot out of reading your blog!! I have a friend I can talk to about these things, religion, beliefs, spiritual issues, but it is nice to learn about your own beliefs and view point on things. It is refreshing. Well said, and very much needed to be said. Thank you. Came across this post on Aleya’s blog and felt compelled to reblog it. Well said, and much needed. Take responsibility for your own life. Hold on to negative emotions like a piece of hot coal in your hand. Let it go. Be infinitely kind to others. And to yourself. Discover the sacred mystery of forgiveness. See God in every tree, every leaf, every flower, every person. Get to bed by 10.30 every night!